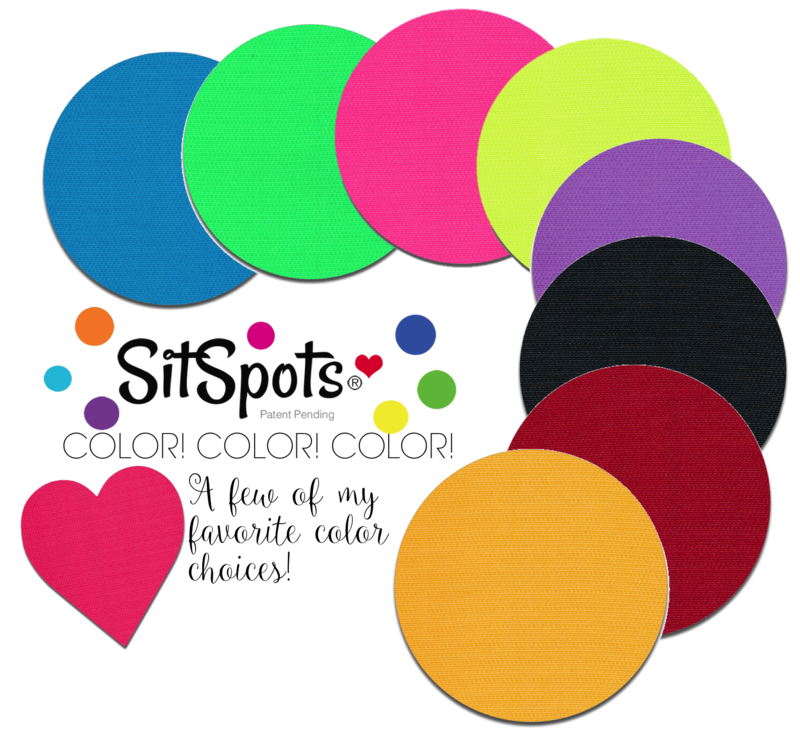 SitSpots – An AMAZING Classroom Rug and Management Tool! 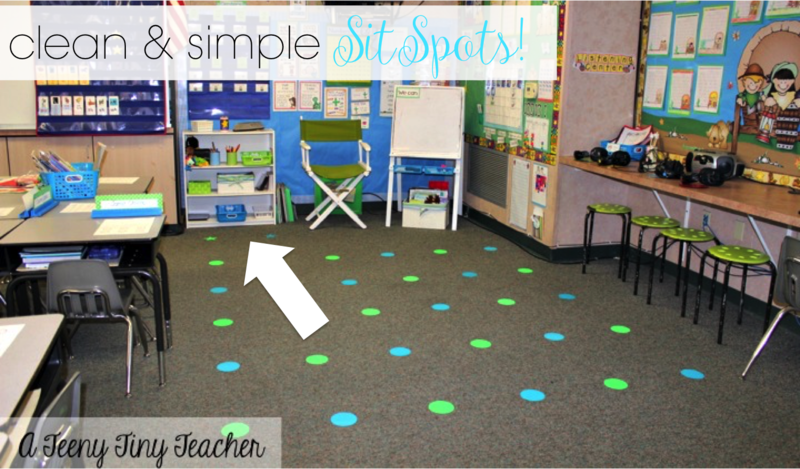 Have you heard of the incredible classroom rug and management tool – SITSPOTS?! I am beyond thrilled to have run into this teacher and inventor at one of the presentations I did. She’s fabulous. Her company is fabulous. 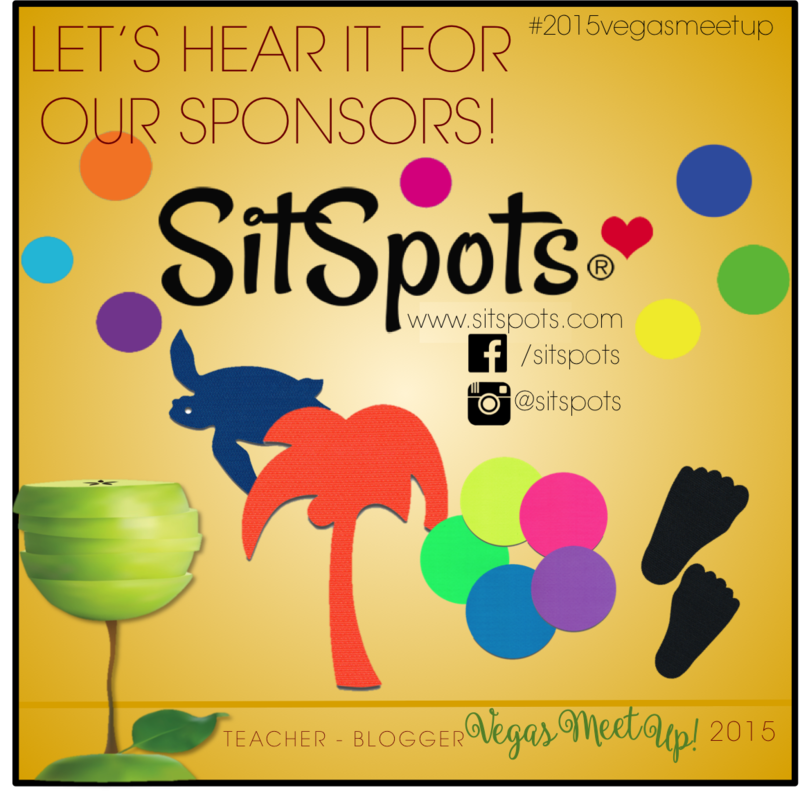 The owner and creator of SitSpots is a Kindergarten teacher. She understands what we deal with in our classrooms each and every day! Her invention is PURE GENIUS. SitSpots are a perfect alternative to those bulky, extremely expensive and easily dirtied rugs, foam mats and taped “sitting squares”. In my room I’ve tried all kinds of things as a rug alternative. For quite a while I used those foam puzzle squares. There are so many colors to choose from so I was able to find just the right blue, purple and green to go with my room. When you need 30 spots of little peep bottoms, these spots do the trick! “Let’s go to the spots!” I say. And off they go into neat little rows. My teammates have themed rooms like I do. Frankly there isn’t a whole lot out there for dragonflies, but ladybug paraphernalia is abundant. I took some red SitSpots and added some black detail to make little ladybugs for her little ones to sit upon. So fun! What’s more fitting for a QUEEN BEE than a floor buzzing with bees? I LOVE that they are so easy to personalize! There is just so much you can do with SitSpots. They aren’t just a classroom rug alternative! They are perfect for sight word walks, sight word bingo – floor size!, even a game of bean bag toss can be turned into a word or math practice activity using SitSpots! 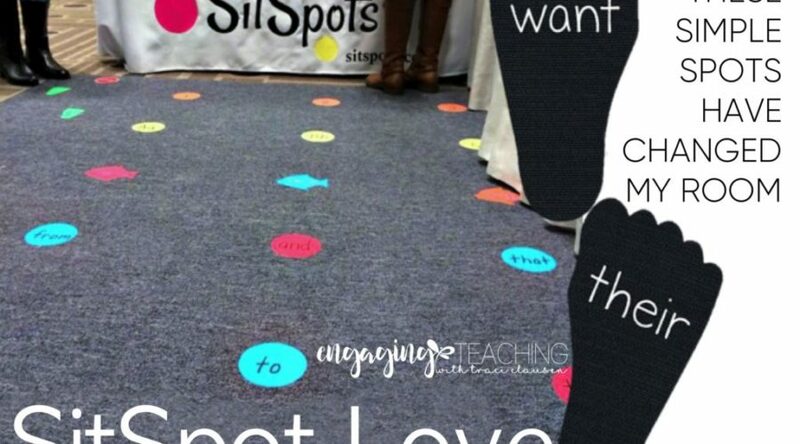 Check out this post about how I use SitSpots in my room for a fun sight word word walk! My sweet friend Kristin over at A Teeny Tiny Teacher not only uses SitSpots that match her decor as her classroom rug, she also uses a couple of the star-shaped spots as the “performer’s spots” during her Readers Theater activities. Simply adorable. 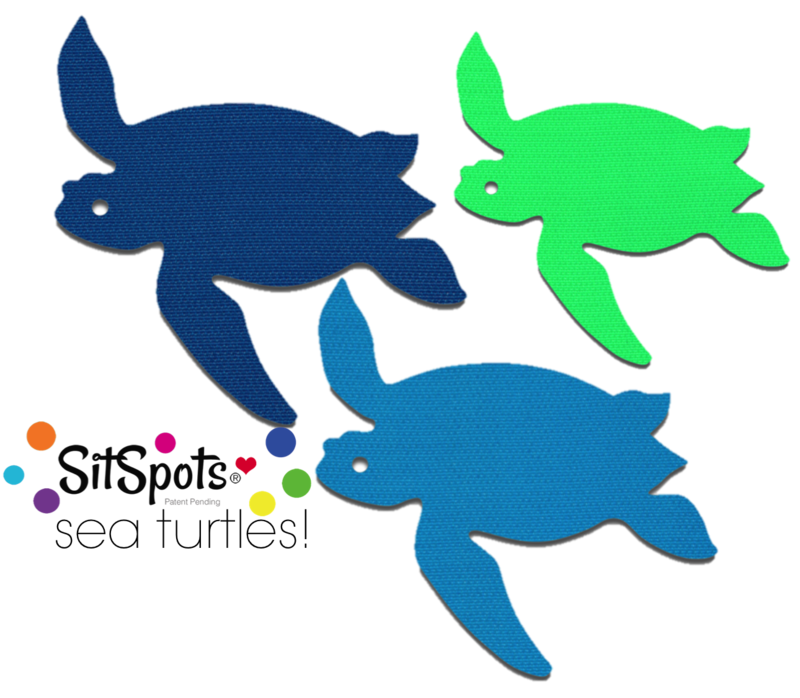 My latest obsession is the sea turtles! How cute would these be in an ocean/beach themed classroom!? LOVE THEM! Yep, besides the usual shapes (circles, ovals, squares, triangles, etc.) there are objects! Palm trees, fir trees, butterflies, paw prints, people prints (footprints)… the list goes on and on. Visit their site to see the selection! I could go on and on talking about SitSpots. Head on over and check them out for yourself! They truly are AMAZING! We are thrilled to have them as a sponsor for our 2015 Vegas Meet Up and can’t wait to visit their booth while we are there! I really need to retire my foam mat. I just ordered a sample. Do you think the students would peel them up? Thank you for sharing. Once they are down, they really are down. The kids would really have to "work at it" to get them up and in that time, you'd notice. I set really strict rules at the beginning of the year that no one is to mess with the spots, and they don't. Not a single spot has been disturbed by a student in my room for two years! I ordered $100 worth of star-shaped SitSpots last year, and by the third week of school almost all of them were peeling up at the points. I had to remove them completely by October. Waste of my own money. Maybe if I had ordered round ones they would have lasted longer. Whatever you do, don't order the stars! Cute ideas for ladybugs and bumblebees, though! I used them in my classroom this past year. I bought the different shapes (circle, square, rectangle, and oval) and the shapes with the corners were peeling at the corners.. The circles and ovals stayed tight. Next time I order, no corners! I love my SitSpots!!! I use them to mark where there line leaders stand at the classroom door so there isn't bunching and pushing. I also use it in several ways with literacy and math stations. I have about 12 different colors spread throughout my room and the kids know that it is the designated workspace for a center (i.e. Take be red station to the red spot, etc.). It also was great for math partners. They had a partner and a spot so I would just give materials and they would go.